Outdoor Educators are operating at Cumberland Nature Reserve, only 15km east of Pietermaritzburg. This Nature Reserve is an environmental treasure trove as it is home to an abundance of wildlife, variety of plant species and indigenous forest. The reserve borders on the Umgeni - river and the Rietspruit that runs through the property, cuts through the African thornveld to form two beautiful waterfalls. With high cliffs, a wide diversity in nature and some beautiful scenery, it is a magnificent area to visit, indeed. The Outdoor Educators’ management would like to work together with those responsible for booking the program to ensure that the program is tailor made to suit their specific requirements. Environmental Education programs (we can also arrange for specialists in plant/ tree identification, birds and snakes to be part of your program). Our programs can be from a half – day experience to a full comprehensive five – day camp and we have a range of activities that is suitable to various age groups. We also accommodate church groups and offer affordable options in self – catering and activities. 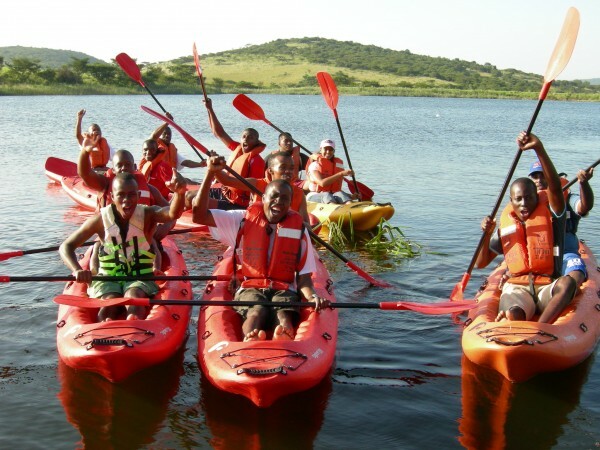 Hiking and game viewing, with nature experiences like swimming under a 15 m waterfall, etc. There is a range of spectacular hikes of different difficulty levels available. Groups need to book in advance to make use of our service.